Nick Sinnott-Armstrong, a high-school student who completed a summer research project in the Dartmouth College Superfund Research Program (SRP), took first prize for his work in a programming contest at the Genetic and Evolutionary Computation Conference (GECCO), held July 8-12 in Montreal. 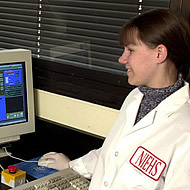 Sinnott-Armstrong worked with Casey Green and Jason Moore, Ph.D., of the NIEHS-supported Integrative Biology Core (IBC) at Dartmouth to analyze and present epidemiological data using computer technology normally found in 3-D video games. He is the first author on a newly published paper (https://www.ncbi.nlm.nih.gov/pubmed/19630950?ordinalpos=1&itool=EntrezSystem2.PEntrez.Pubmed.Pubmed_ResultsPanel.Pubmed_DefaultReportPanel.Pubmed_RVDocSum) reporting on the application in health research. An advanced Graphical Processing Unit, or GPU, runs an adaptation of another Dartmouth innovation - a machine learning algorithm called Multifactor Dimensionality Reduction (MDR) (http://www.multifactordimensionalityreduction.org/) . MDR was built to detect and characterize interactions among various attributes to determine predictors of a particular outcome. It has been practically applied to the analysis of gene-environment interactions in genome-wide association studies. The technology developed by the Core directly supports research efforts within the Dartmouth SRP. 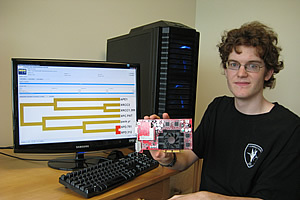 "The... GPU... reduces computational time by nearly 150-fold, compared to traditional computational methods," said Moore (http://dms.dartmouth.edu/faculty/facultydb/view.php?uid=2882) , who heads the IBC. "This significant speedup will greatly improve our ability to search through genomics datasets to identify those genes that interact with toxic metals and other environmental factors to influence susceptibility to common diseases such as cancer." Citation: Sinnott-Armstrong NA, Greene CS, Cancare F, Moore JH (https://www.ncbi.nlm.nih.gov/pubmed/19630950?ordinalpos=1&itool=EntrezSystem2.PEntrez.Pubmed.Pubmed_ResultsPanel.Pubmed_DefaultReportPanel.Pubmed_RVDocSum) . 2009. Accelerating epistasis analysis in human genetics with consumer graphics hardware. BMC Res Notes 2(1):149. [Epub ahead of print]. "SOT Holds Reception..." - previous story next story - "Friends and Colleagues Mourn..."
Last reviewed: 04 August 2009.